Top one is Very Vanilla with rainbow blue mica, the color may still shift on this one as it cures. 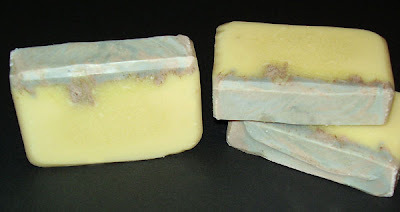 side note I may be doing a give away very soon, I am thinking a box full of my reject scents, bad cuts, old soap mold(smaller sized), this batch! Still good soap just not great soaps! stay tuned. The bottom one is Nag Champa with brown oxide and activated charcoal. 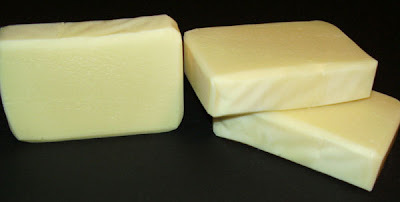 Nightmare Anthology reviews my soap! better pictures coming soon, my normal picture taking area is down right now while my apartment is fixed after a small flood. so my new thing I am working on is pushing myself to do scents I don't usually like but that others will like. 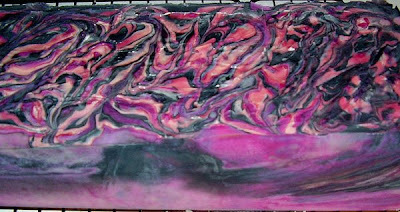 To start out with I am carrying a dye/scent free bar which I just made this weekend (see picture). 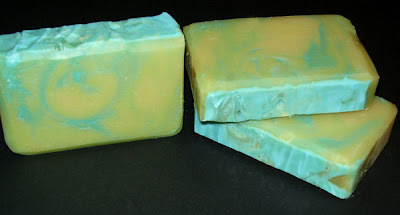 Going to work on adding Patchouli, Nag Champa, Basil Sage Mint, it is also time to bring back vanilla! I need to come up with a bakery type one to add. banana cream pie? blueberry cobbler? pumpkin cheesecake? cookie jar? chocolate raspberry drizzle? granny's pie crust? or? help!?!?!?!? I am getting better at them but still having troubles. 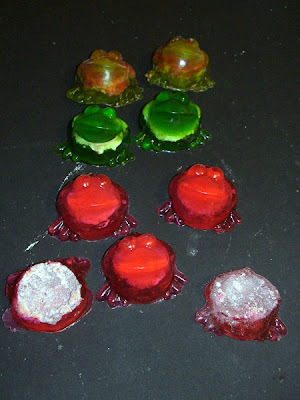 The frogs in the front are the most recent ones I have done and the ones towards the back were some of the first. As you can see some are missing their heads, but they don't have nearly the bubbles on the bottom. Others you can see the insides too much so I am getting closer to having these figured out but I still need more work. Need to knock some more out as I am trying to get a box going out to my sister's kids(they live in colorado) for testing they already can't wait to see them. I am testing a frog myself and it still hasn't exploded yet, can't wait to see what it does when it finally does explode! 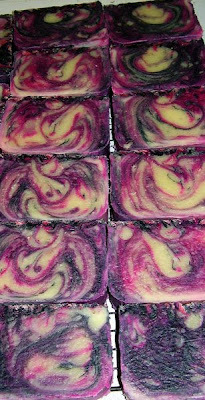 It seems red and blue sure can give some trouble in soap making . Once again my red went from a deep red to all different shades in the same batch and more on the purple side then red. It still came out cool just not 100% what I had in mind. This one had BC bright red gel tone, and activated charcoal for the black. I get to thinking about this often while looking at other people's sites. I feel I have pretty decent prices maybe on the cheap side compared to others. That price difference doesn't mean my products aren't as good as the more expensive ones. I can offer lower prices because my overhead can be much cheaper then other people. I happen to live in Los Angeles, which allows me to get a large number of my supplies locally. I don't have to pay shipping costs on the heavy stuff other people do and then they have to pass on those charges to the price of the products they offer. I am able to drive within a mile to pick up such things wax, candle jars and many other things that would cost a ton of dollars to ship. Same goes for my soap supplies, I can get the heavy oils around here thus saving tons on shipping costs. I do have some things shipped to me but they aren't the big items. Living in a big city has it advantages for sure. If I come to the point of moving back to the county in Colorado again I am sure I would have to charge more as I too would have to depend on having things shipped to me. Until then I am happy to pass my savings on supplies on down to my clients. 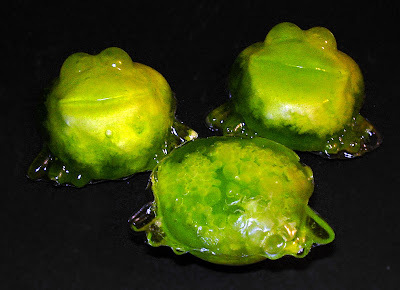 Well on to other things, round 2 of the exploding frogs went about the same. Still mastering these little guys, looks like they are going to be a challenge to figure out. I am still getting a reaction so I may try pouring the last pour while in the freezer next time. 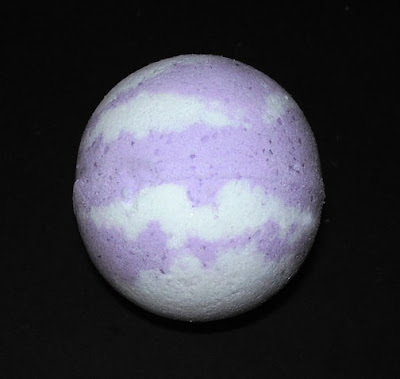 Got some new colors in for making the bath bombs so I made up another batch of lavender ones and they came out pretty nice (see pic). I really need to find more colors, if you didn't figure it out yet I love colors! I always had very vivid photographs when I was in photo school and after, guess that still continues in my other "artworks". Well off to make more bath bombs! I will say the batch of bath bomb mix wasn't up to my normal ones, this had the hints of being the giant blob(see blog post a few down)again. So I will need to try again and see if I can get that part better, the reaction caused some bubbles on the underside see picture. The key to these it to get them into the freezer ASAP which helps stop the reaction so I really need to work on my speed as well. I am sure my niece and two nephews will still be happy to test these out for me, they were scented in Blue Raspberry Icee. The bath bombs I made tonight for a client were lavender and I should be able to post a picture in the next day or two provided they don't turn into the dreaded blob that is!